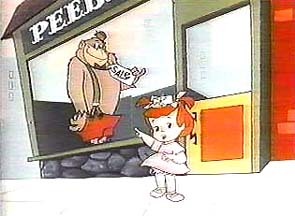 Magilla Gorilla was a lovable ape who resides at Mr. Pebbles Pet Store. 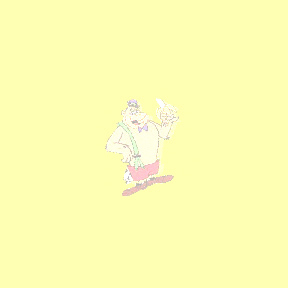 With each episode, Mr. Peebles desperately trys to sell him, while Magilla's asking price would get lower and lower, and someone would occasionally buy Magilla. 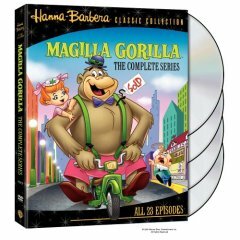 Then for various reasons, with one catastrophy after another Magilla would always end up back at the store.The kids just love Magilla Gorilla and one who actually wanted him for a pet was a little girl named Ogee, but she could never scrape together enough money, no matter how inexpensive he got. 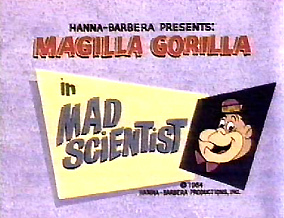 I know if I had a gorilla like Magilla. I would keep him in my bedroom, and on my bunk bed, he would not be on top of course, He would be to unpredictable. 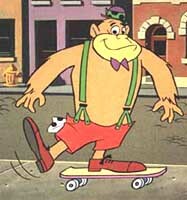 Picture of Ogee "How Much is that Gorilla in the Window?"